Boulder’s Mayor Coming to Minneapolis to Discuss Energy Options! In November 2011, the citizens of Boulder, CO, voted to allow the city to proceed with a long and thoughtful process toward municipalizing their electric utility. On Tuesday, Sept. 18 at 8:00 AM, join Minneapolis Energy Options and Boulder, Colorado, (former) Mayor Susan Osborne and Institute for Local Self-Reliance Policy Senior Researcher John Farrell to learn more about Boulder’s shift toward clean, local energy and what’s happening in Minneapolis! RSVP today to save your seat for “Green Ideas & Ham” with Susan Osborne! Minneapolis was one of the first cities to sign the U.S. Conference of Mayors Climate Protection Agreement, which established ambitious goals to cut emissions and increase renewable energy. More than forty other cities across Minnesota have signed the agreement as well. The city has a goal of cutting its global warming emissions 30% by 2025. The city gets most of its energy through Xcel Energy and Centerpoint Energy, and while these utilities have made some progress, Xcel’s carbon emissions actually increased last year. If Minneapolis is going to meet its global warming reduction goals, Xcel and Centerpoint will need to sharply reduce their emissions and encourage clean energy programs in the city. But neither utility has shown strong support for local renewable energy programs and Xcel even proposed eliminating the popular Solar Rewards Program. As the franchise agreements between the city and Xcel and Centerpoint are coming up for renewal, it’s time to find more ways to drive clean, affordable energy in Minneapolis. 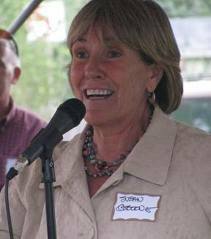 Former Boulder mayor Susan Osborne will explain how Boulder ended up with a ballot measure to form a municipal utility and why they were motivated to change their energy options. As always, the event costs $15 for each attendee. That includes a $5 donation to event host Environment Minnesota, and $10 to the Red Stag Supperclub. Doors open at 7:30 and the tasty breakfast buffet begins at 7:45. 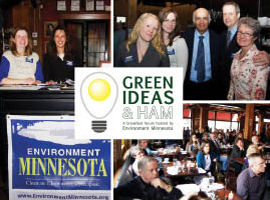 Click here to RSVP and donate $5 to Environment Minnesota ahead of time.